Additional $9.95 for Postage + Printing. Posted within 24 hours of your order (weekdays only). Contemporary, Energy Efficient house plans. The Solar Solutions ECO Dwellings Study Set includes series includes a range of over 40 optional energy efficient homes to choose from. The Eco dwellings series is designed to suit most suburban blocks and there a four different sets of homes to suit the direction that your block faces. If you have purchased the Eco Dwellings planbook, you can select the series that suits your block and the style of elevation you would like. Each study set is in an easy to read PDF format, or can be posted to you in a hard copy. Each Study Set includes a fully dimensioned floor plan, Roof Layout and 4 Elevations. Hard copies of our Study Setsare now available and can be posted to you for an additional $9.95 per book. Which way does your House face? 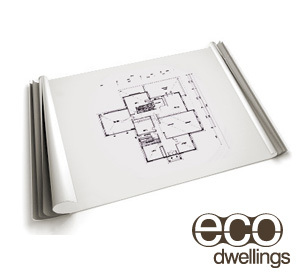 The ECO Dwellings series is designed for houses that face every direction, whether your northern exposure is to the front of your block or at the rear, there are plans to suit the conditions of your block. Below is the layout for each style of home with the front of the house facing the circle.